"An electrifying ride that rings with authenticity..."
"An engaging premise, smart and exhilarating. An electrifying ride that rings with authenticity. No question, this is an auspicious beginning for C.S. Graham." "C.S. 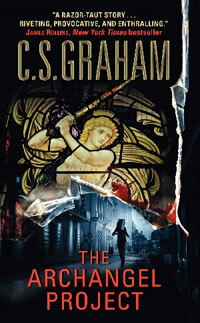 Graham's THE ARCHANGEL PROJECT is as current as today's headlines and as disturbing as your darkest nightmare. Political intrigue and ambition mix into a razor-taut story of one woman's struggle to understand her strange gift while piecing together a plot to trigger Armageddon. Riveting, provocative, and enthralling, here is a debut not to be missed." "Fast-paced fun! C.S. Graham mixes up careening action with compelling characters and fascinating research to create a roller-coaster ride of suspense." "Novelist Candice Proctor (Why Mermaids Sing and others as C.S. Harris) and her husband, Army intelligence officer Steven Harris, collaborate on this rollicking suspense novel. October "Tobie" Guinness is a remote viewer who sees unpredictable flashes of things miles away. When she discovers a conspiracy by key defense industry and government personnel to plan a 9/11-type attack and turn public sentiment against Iran, the conspirators decide that she and the professor training her must die. Jax Alexander, a CIA agent one mistake away from being fired, goes to New Orleans to investigate the professor's death and stumbles into the plot. Jax and Tobie run for their lives, trying to stay one step ahead of the killers, piece together the plot and avert an unjust war. While Tobie is trapped by circumstances, shockingly capable and intelligent but tormented by her gift, Jax is the consummate skeptical patriot. Conspiracy fans will love this impressive series opener."